New Delhi: The city designed and built by the British in the 1920’s- a city of wide boulevards impressive Government Buildings, green parks and gardens. First you will visit the two monuments from the Delhi’s past Humayun’s Tomb and Qutab Minar. Then your drive takes you along the ceremonial avenue, Rajpath, past the Imposing IndiaGate and Parliament House. After completing the sightseeing return back to the Hotel for Overnight. Breakfast at hotel. After breakfast this morning assisted in transfer to the International airport to connect the flight for Paro your starting point for the Bhutan trip. On arrival at the airport received and drive to Thimphu, the modern capital town of Bhutan. On arrival check in to the hotel. Rest of the day free at leisure. Overnight at the hotel in Thimphu. Breakfast at hotel. 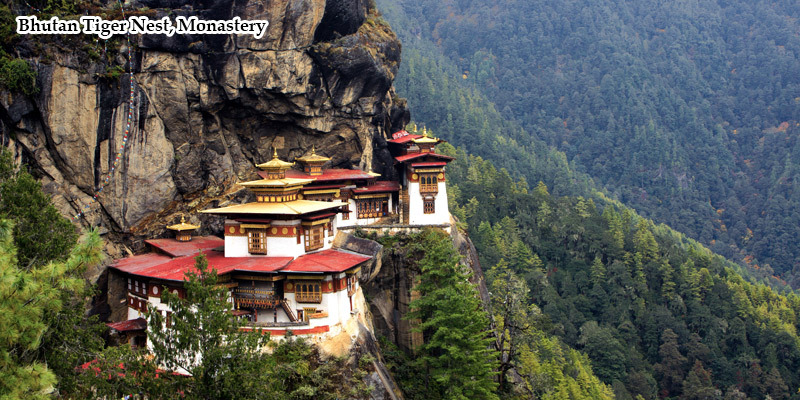 Afterwards embark on the sightseeing trip of the city which would include your visit to Trashichhodzong, the beautiful medieval fortress/monastery which houses most of the Government's office and King's Throne room. It is also the summer residence of Je Khenpo, the Chief Abbot. Then visit National Library which has vast collection of ancient Buddhist texts and manuscripts. After that drive to Painting School, famous for traditional thangkha paintings. Here you will see, students at work producing intricate design on cloth. Also visit to Traditional Medicine Institute is worthwhile where centuries old healing arts still practiced. Later visit Textile and Folk Heritage Museum, a fascinating testimony of the Bhutanese material culture and living traditions. In the afternoon visit Handicrafts Emporium which displays wide assortment of beautifully handwoven and crafted products. Then drive to Memorial Chorten, the stupa built in the memory of Bhutan's Third King who is popularly regarded as Father of modern Bhutan. The paintings and statues inside this monument provide a deep insight into Buddhist philosophy. Evening drive to Punakha across Dochula pass (3,050m ). Overnight at the hotel in Punakha. After breakfast visit to Punakha Dzong, the 17th century fortress which has played important role in building up of modern Bhutan followed by visit to local market. Also visit here, Khamsum Yu;;y Namgyal Chorten, the newly built stupa. Then drive to Wangdiphodrang visiting Dzong and local market. The district of Wangdiphodrang is also famous for its bamboo products, slate and stone carvings. After lunch drive to Paro with a short stop at Dochula pass. Later enroute visit Simtokha Dzong, the oldest fortress of the Kingdom built in 1627, it now houses the School for Buddhist studies. Overnight at the hotel in Paro. After breakfast visit Ta Dzong, the National Museum of the Kingdom. Originally built as Watch Tower since 1967 it is acting as the National Museum of the country and holding fascinating collection of art, artifacts, thangkha paintings and Bhutan's exquisite postage stamps. Then walk down the trail to visit Rinpung Dzong which has a long and fascinating history. After lunch drive north of Paro valley to ruins of Drukgyel Dozng. From this fort Bhutanese repelled several invasion by Tibetan armies. Nearby visit traditional Bhutanese Farm House which offers good insight into lifestyle of local people. While return to Paro town visit enroute Kyichu Lhakhang, one of the oldest and most sacred shrines of the Kingdom. Overnight at the hotel in Paro. Breakfast at Hotel. Free till departure. This afternoon you are assisted in your transfer to the airport to connect your flight back for Delhi. Upon arrival in Delhi, in Transit, to connect the flight back home in the evening. Copyright © 2017 - 2018 TravelDestinationsofIndia, Inc. All rights reserved. www.Jetwaystravels.com is a registered trademark of Jetways Travels, Inc.